I have three words for these lemon almond cookies – quick, easy, delicious! This simple cookie recipe requires only a handful of ingredients and takes 25 minutes from start to finish. Awesome, right? They are made with ground almonds, organic beet sugar, zesty lemon, egg whites and rolled in a little powdered sugar to give them a little bit of a crackled effect when they bake. In Canada, we call these crackle or crinkle cookies — a must have at Christmas time. And since there is no flour in this recipe, these Christmas cookies are also gluten-free. 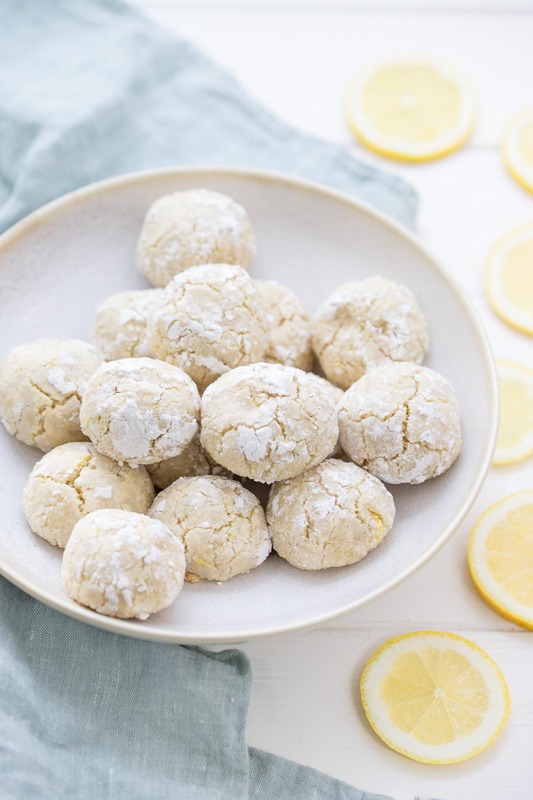 All you need to do to make these cookies is mix together the dry ingredients with the freshly squeezed lemon juice, beat the egg whites, roll the cookies into balls, and then into powdered sugar, pop them in the oven and within half an hour you are taste-testing these delicious gluten-free lemon almond cookies. What you can expect are a tangy cookie with a little bit of sweetness. Just enough to balance the lemon and still satisfy a sweet tooth. Heavenly! I made these a couple time for colleagues, once with a little more ground almonds, but I had the feeling, as delicious as they were, that they were a touch to dry. So even that the cookie dough seems a little wet for this recipe, I prefer the cookies this way. You can always add 20 g more almond flour if you like a dryer cookie, or 1 tablespoon arrowroot powder. Either way, the result is a delicious lemony cookie. Also, if you prefer to make these in more of a cookie form than a ball, then use the bottom of a small glass to flatten the balls slightly before dipping them in powdered sugar. 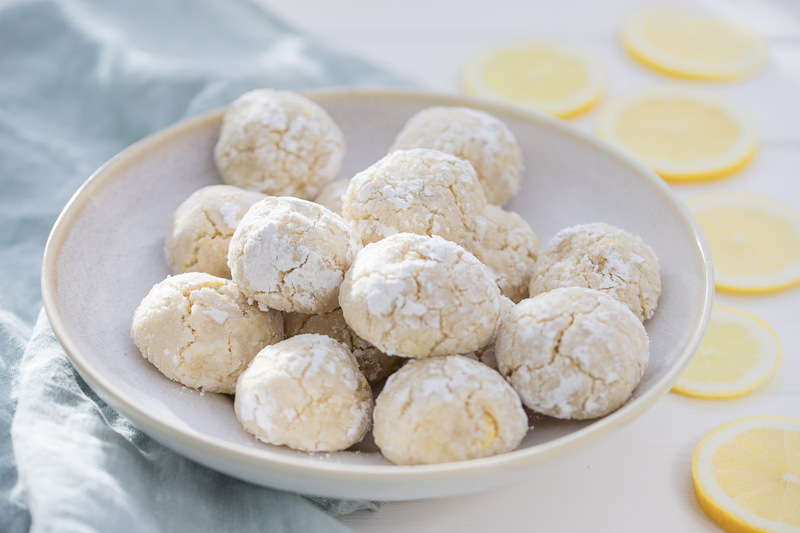 Quick and easy, these lemon almond cookies are perfect if you want to bake cookies and not spend a lot of time in the kitchen. Plus they are delicious and naturally gluten-free. Pre-heat oven to 325°F / 165°C and line a baking tray with parchment baking paper. In a large bowl, whisk together the almond meal, sugar, baking soda, and lemon rind. Add the lemon juice whisk together to combine. Place the egg whites in a separate bowl and with an electric mixer beat until it forms soft peaks. Gently fold the egg whites into the almond mixture until smooth. Roll 1 tablespoon of mixture into a ball, repeat with the remaining mixture. Place the icing sugar in a small bowl and toss the dough balls into the icing sugar until well-coated. Place on the prepared baking sheet leaving a few centimeters space between each cookie. Bake for 14-16 minutes, until lightly golden. Allow to cool slightly on trays before transferring to wire racks to cool completely. 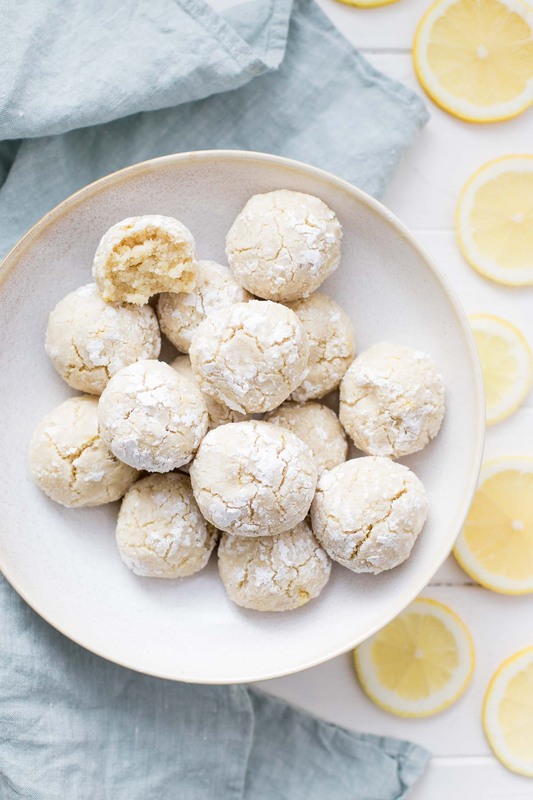 If you make this easy gluten-free lemon almond cookies recipe, I’d love to hear how it turned out for you! Be sure to rate it and leave a comment below to let me know! Especially if you have tips for other readers. Or take a picture and tag me on Instagram @ellerepublic and don’t forget to hashtag #ellerepublic so I don’t miss it!